Arsenal striker Joel Campbell singed new deal Arsenal striker Joel Campbell signed a long term deal before joining the La Liga side Villarreal, according to Arsenal.com. Arsenal striker Joel Campbell signed a long term deal at Emirates before joining the La Liga side Villarreal, according to Arsenal.com. Joel Campbell joined the Spanish outfit for the remainder of the season as a part of Gabriel Paulista deal who joined the Gunners on a permanent deal. Arsenal boss Arsene Wenger paid around 11 million pounds for the Brazilian star plus gave the young striker Campbell on a loan deal. 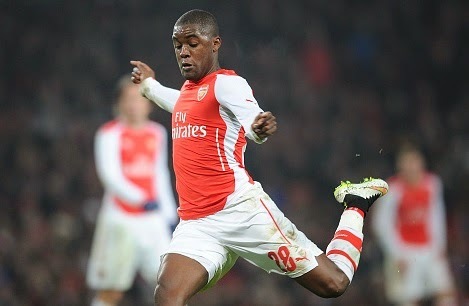 Campbell failed to impress Wenger at the Emirates despite of his summer’s World Cup performances for Costa Rica. He made only ten appearances in total this season, four in Premier League only. He has not been as impressive as Danny Welbeck and Olivier Giroud who are always in front of him. Campbell who has been admired by Arsene Wenger several times signed the long term deal before leaving for La Liga club, the club confirmed earlier today. the length of the contract is not clear, may be a four or five year deal. The 22-year-old is likely to play a major role from next season if he shines in the La Liga. The Costa Rican has a big chance to impress Wenger once again in La Liga and to be a great striker for Arsenal in the future.